Press | Kathryne Designs, Inc.
Kathryne’s work has been featured in numerous publications and design books including California Homes, House and Garden, Traditional Home, Designers West, Southern California Homes & Gardens, California Kitchen & Bath, Woman’s Day, Valley Magazine and the Los Angeles Times. 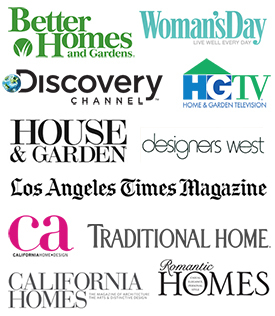 Her projects have been featured frequently on House & Garden TV, KNBC, KCBX and the Discovery Channel. Kathryne has participated in many south land design homes including the Pasadena Showcase House of Design, California Showcase and the Bel Air Showcase. She was the designer of the kitchen at the Getty House – the official residence of the Mayor of Los Angeles.